The first race at Goodwood in September 1948, by the Junior Car Club (JCC). Homepage. This page: Looking back at the JCC's report on the first race meeting at the Goodwood circuit, 1948. Junior Car Club at Goodwood, 1948. A suggestion to anyone planning to visit the next Goodwood Revival meeting. While you're making steady progress towards the parking areas early on the morning of a day's racing, picture the scene some 60+ years earlier, as spectators filed in to witness the first ever race meeting. Motor fuel was still strictly rationed, so competitors and spectators alike had to be creative in sourcing the precious liquid to fulfil their ambitions of attending the inaugural Goodwood race meeting. Spectators' cars, most of pre-war origin and often run on a shoe-string, filed into the public car park, many leaving a haze of oil smoke in their wake, their hard-worked engines no doubt running hotter than they'd like. Many road cars would have spent the war years on bricks, waiting for a time when they could be released from their captivity, and return to the road once more. In the days before MOTs, many would have worn their age on their running boards, baling twine and string being a common feature of the more weary machine. Mum and dad in the front of their car gathered their bearings, while children in the rear, perhaps attending their first race, looked out excitedly, as other cars, pedestrians, and motorcycle riders weaved alongside, all keen to park up and inspect the facilities. If they were lucky they might spot a converted furniture lorry, or ex-services vehicle, rumbling along, a carefully-prepared racing machine tucked away inside, with only the eagle eye of the scrutineer standing between it and an afternoon's racing. The meet was organised by the J.C.C. (Junior Car Club) for September 18th, 1948, thus transforming what had been RAF Westhampnett in Sussex, a venue more accustomed to the throb of V12 Merlins pounding along its grassy dew-laden runways, into a location for head-to-head dicing of the four-wheeled kind. Shown above is a copy of the J.C.C. Gazette for July/August/September 1948, its cover illustrating the simple grass paddock area, that ran parallel to the start/finish straight. No grandstands, no hard surface to the pit area, nor any covered pit garages for stressed mechanics to fettle their charges before the five-second sign, and then the start flag, were raised. Prior to the race itself, the course was officially opened by the Duke and Duchess of Richmond and Gordon, making steady progress around the course in their Bristol, followed by Wing-Commander Tommy Wisdom (Bentley), then the Hon. Denis Berry - with wife - also in a Bentley. It was Wisdom and another Wing-Commander, Tony Gaze, who first mooted the idea of transforming the perimeter track of the airfield into a venue for motor sport. 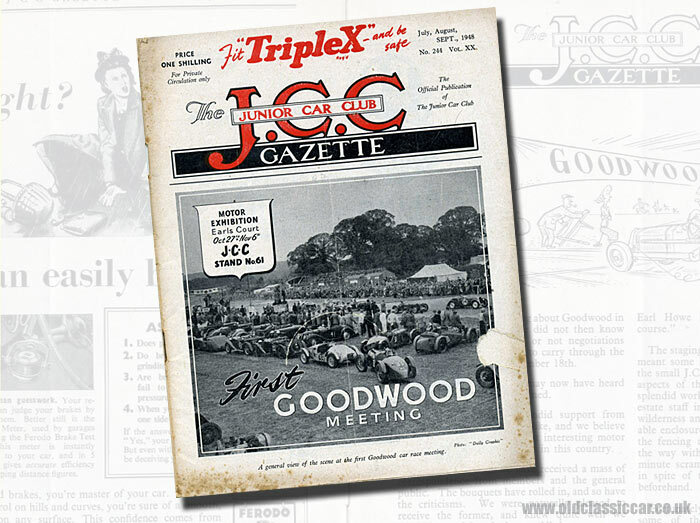 As the photograph on the cover of the Gazette confirms, the Goodwood of 1948 was quite different in appearance to that of today, or even of 1966, the final year of racing before the circuit's closure. The circuit in its early years felt very much like an airfield by all accounts, although somewhat less windswept than many former airfields dotted across the country, including that at Silverstone, which too hosted its first official race in 1948 (the programme for which can be seen here). As already pointed out, there was no hardstanding in the paddock area, just mown grass tidied up for the event. Covered pit areas would only be introduced later, so there wasn't a mechanic out there not keeping a weather eye open on the sky, in case of imminent rain showers. Access to the in-field was over the track itself, the tunnel not yet having been dug. While the facilities at the track have come on leaps and bounds since the first meeting, one thing has remained (broadly) constant, the track. The introduction of the Goodwood Chicane (or Paddock Bend as it was officially named but rarely referred to) immediately prior to the start/finish straight was the only significant alteration to the course in its entire history, introduced for the 1952 season. Run-off areas have increased subtly, tarmac surfaces improved, and raised spectator banking that incorporates tyre crash barriers have been introduced, but otherwise the circuit - to drive - is just as it was at the early meetings. Prior to the war, the slogan "the right crowd and no crowding" applied to the Brooklands course. Following the war, with the Weybridge course no longer in use, the slogan could now apply to Goodwood, and to an extent still does, although crowds can slow down the spectator's progress around the site. "One of the most amusing sights imaginable, was the principal enclosure, the morning after the meeting. The rails were lined with rusty oil cans, tins, stoves, and an assortment of boxes, bricks and planks. A large section of the crowd in their determination to get a better view had improvised their own stands with the assistance of nearby 'dumps'." 8. "Daily Graphic" Goodwood Trophy for Formula 1 cars (Maserati 4CLT/48). A profit in the region of 1000GBP had been made, and this, coupled with the promising attendance figures and feedback from everyone present, convinced the organisers that they were on to something. The Goodwood Road Racing Company was formed, and plans set in motion for return visits in 1949. The JCC, at their AGM in January 1949, having joined forces with the BARC (Brooklands Automobile Racing Club) voted to re-name the new organisation the BARC (British Automobile Racing Club). Examples of the new organisation's club magazine can be found on the BARC Gazette page. In 1966 the Goodwood circuit closed as a venue for motor racing. Over the following years it would be used for testing purposes, and the occasional club sprint. In 1998, spurred on by the success of the Festival of Speed at the main Goodwood House, the circuit re-opened its doors as the Goodwood Revival. Dad and I have been to most of the Revival meetings. The attention to detail is incredible, and year-on-year the spectacle has grown and grown. Aviation has always played a large part in the activities in and around the circuit, and a concours for beautifully-preserved aircraft is a recent development. Elsewhere in this issue of the JCC Gazette. While Goodwood was the main topic of conversation in this issue, with race-by-race reports occupying the early pages, there were other stories to report via the Gazette's thirty pages. The winner of the 1948 British Hillclimb Championship was announced, with Raymond Mays taking the spoils, a mere point ahead of Poore, with Allard and Hutchison taking third and fourth places respectively. Mid-August had seen a JCC rally to Switzerland take place, with the Triumph Roadster of Mr and Mrs Stephenson, with their young son Warnaby, taking the win. There were also several references made to the upcoming Motor Show, a show where the public could look but, for the majority, couldn't buy, as concerted efforts were being made to export new cars wherever possible, to bring in the ï¿½ to help with the post-war reconstruction of the country. Highlights on the MG stand would include the new TC Midget two-seater, a 1,250cc saloon, and the 1,250cc Tourer. The latest range of Lea-Francis saloons and tourers was also expected to receive some good reviews, post-show. Somewhat further down the automotive food chain, potential buyers of small Fords could ogle the latest Anglia and Prefect models, re-workings of what were very pre-war designs. A number of Goodwood-related articles can be found across the oldclassiccar.co.uk site. One page which will be updated from time to time is titled Goodwood Collectables, on here a number of interesting old items relating to the famous circuit will feature. The site search will bring up references to, and photos of, some of the meetings that we've attended so far. Return to the car magazines section.